We've had the 18 lap appetiser, now we have the 38 lap main feature, complete with compulsory pit stop for tyres. In addition, drivers get to use their 'power boost' button up to 8 times in this race. In addition to being twice the length of the Sprint race - and the pit stop - the other big difference is that the Feature race sees the cars start from a standing start - a traditional grid. 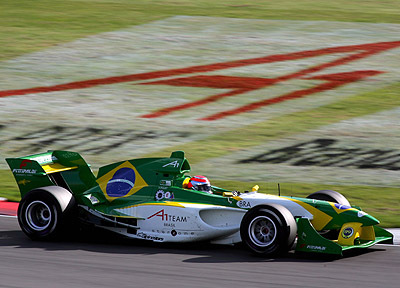 Sprint race winner, Brazil (Nelson Piquet) starts from pole, ahead of France, New Zealand, Australia and Britain. The other point of note is that Alex Yoong is driving the Malaysia car in this event. As the field pulls away for the warm-up lap, New Zealand fails to get away, which is a disaster for the Kiwis, but good news for Britain, which now has some clear air ahead on the grid. As the field slowly makes its way around the Kent track, the all-black car is pushed back into the pitlane. Is it all over before it's even begun for Halliday? Yes, the car waits at the end of the pitlane, anticipating the green lights. France stalls on the grid, and it is a miracle that nobody hits him. Meanwhile there's a crash at Graham Hill bend with Ireland involved in an incident with Switzerland. There's further chaos as the Lebanon car spins off and then back onto the track, almost collect a few rivals. Out front, Brazil is unchallenged, as Portugal is out, following an (unseen) accident. Meanwhile, the Czech car has a big moment, other than over-enthusiasm, the problem appears to be lack of grip. We also appear to have lost USA. Japan and Germany are side by side, Scheider appearing to use the power boost to take eighth. Brazil leads Australia by 3.8s, with Britain third, ahead of Pakistan, Italy, Malaysia, Germany, Netherlands, Canada and South Africa. We really are seeing some great battle now, in particular Pakistan and Italy for fourth, and Malaysia and Germany for sixth. South Africa is all over Canada for ninth. USA is back in the race, but a couple of laps behind. As Germany pits, Netherlands moves up to seventh, Jos Verstappen having a great race. Britain is all over Australia, but Will Power is having none of it. Alex Yoong is giving a strong performance for Malaysia. Fastest team on track is Brazil, though Czech Republic is also very quick. Kerr (Britain) goes sideways clipping the kerb in his effort to hound Australia, this is great stuff. After 8 laps, it's: Brazil, Australia, Britain, Pakistan, Italy, Malaysia, Netherlands, Canada, South Africa and Czech Republic. Meanwhile USA stops for a new nose. Malaysia boss justifies 'split' drive decision.